My Foxy Dori & Other Favorites! A few weeks ago, I posted a photo of my brand-new Foxy Dori and teased that a post about was in the works. I'm finally ready to deliver on that promise! I was thinking about the post and decided to also highlight a few of my other favorite things, too. It turned out a little longer than I intended, but I've got a lot to share! I stumbled upon traveler's notebooks one day while searching #MayBooks on Instagram. They were first created by a Japanese company, and those are called Midori Traveler's Notebooks. A traveler's notebook is a leather cover that has elastic bands inside to hold notebooks and an elastic band to keep it closed. The original notebooks come in two sizes and two colors. There are a number of "faux dori" brands, but my favorite is Foxy Dori. Regular Midoris aren't customizable, but other sellers offer leather traveler's notebook covers with so many more options! For example, Foxy Doris are available in three different types of leather, seven sizes and seventeen colors. You can choose if you want a single, double or quadruple strand binding inside, as well as a single or double strap closure. When ordering, you get to choose from a bunch of colors for the elastics and an optional stamp or monogram. Kelly, the creator of Foxy Doris, offers a limited number for sale each day. There's such a high demand (she's sold almost 2,000 since she opened her shop four months ago) that she's regulating how many she sells. If you visit her shop after they've sold for the day, it might look a little empty. So, just check back the next day! Once you buy the traveler's notebook, what are you supposed to do with it? BUY INSERTS! The thing that I love about it is that you get to put anything you want inside. You could use your traveler's notebook as a wallet, for journaling, for projects... for basically anything and everything. It's all up to you! Live Creatively = Ideas / Cassie gave me the Live Creatively notebook for my birthday, and I knew immediately it was going in my Foxy Dori. It's blank, and I use it for jotting down blog ideas. Whether it's planning a blog event or keeping track of possible discussion posts, this gets used a lot. Watercolor Anemone = Quotes / Whenever I read a quote worth saving, I write it down. I've always loved quotes, so I make it a point to include a notable quote in my reviews. I've had "quote books" since high school! This Watercolor Anemone book is lined because I find that's the best for this purpose. Irregular Dots = Book Notes / I didn't start taking notes on the books that I read until just recently, and it's already drastically improved my review-writing process. As soon as I finish a book, I write down key details and my thoughts on it. This Irregular Dots book has the dot grid pages, which I love. I already used May Books for blogging, so I'm obsessed with the fact that I can easily carry all three around with me in my Foxy Dori. I just open each book to the middle and slide it around one of the four binding straps. That's only three straps in use... so what do I do with the fourth? I could have stopped with my three May Books, but I had to have something else at the front of my Foxy Dori. I wanted to learn how to make the most of my notebook, so I watched this YouTube video from The Reset Girl. It's really long, but it's so informative if you want to find more faux dori tips, tricks and resources! One of the things she highlighted in her video was the folder and business card holder in the front of her traveler's notebook. And I knew I needed both in mine, too! I bought two pocket folders from The Lovely Habitat on Etsy (though I'm just using one right now). All I currently have inside are some silly stickers and my library receipt, but I tuck random stuff into it all the time (receipts, notes, bookmarks, tickets, etc.). Then, I bought the Midori business card holder. Following The Reset Girl's lead, I bought some scrapbook paper (this Mambi Sheets pack). I cut twelve rectangles out of the paper and slid them into each of the card slots. Since the holder is clear, I love cute paper showing through instead of whatever is on the other side. In the back (bottom left photo - left side of the holder), I have three bookmarks from craftedvan. Seriously, aren't they adorable?! I actually have a ton, so I switch these out. In the front (bottom left photo - on the right side of the card holder), I've got Post-it tabs, letter H sticky notes and Post-it flags. On the inside, I have some Post-it notes, washi tape wrapped around a used gift card (pink stripe, neon pink, pastel blue, and fun dots), the "Make every day a page worth marking" card that came with my craftedvan order, my blog business cards (design from In My Studio), stickers from Pemberley Pond, and some paper clips. I just fold the card holder in half, tuck the folder inside and slip those two inserts around the first binding strap. Voila! That should explain what a Foxy Dori is, where you can get it, how it works and what I've got in mine. I'm just getting started, and there are lots of people who are much more knowledgeable about them than I am. But please let me know if you have any questions! The YouTube video I mentioned has ton of information on additional insert options, and I recommend searching #FoxyDori on Instagram if you want more ideas! I always have my Foxy Dori with me because I just toss it in my purse and take it everywhere. But there are a few more things I love that I just keep at home. So, I'm going to share those with you, too! Yes, I have a little box filled with sticky notes and washi tape. The box used to have Rifle Paper coasters in it, but I've totally repurposed it. I love sticky notes for bookmarking a page, quick reminders, short to do lists and any other number of things. I usually buy the Post-it brand because, duh, they work the best. I also have a little collection of washi tape - my favorite is the Scotch Expressions line. I like to write on washi it, and I've found that's almost impossible with some brands. But Sharpies always work fine with the Scotch washi tape! I use it to decorate pages in my planner, highlight certain details, designate a new section, and more. I'm totally addicted to buying pens. Even though I don't need more, I just keep buying them! I'm left-handed, so my main requirement for pens is ink that dries quickly. I don't want to drag my hand over my writing and smear it all! In the top left picture, I've gathered what you're most likely to find in my Nate Berkus pencil pouch from Target. 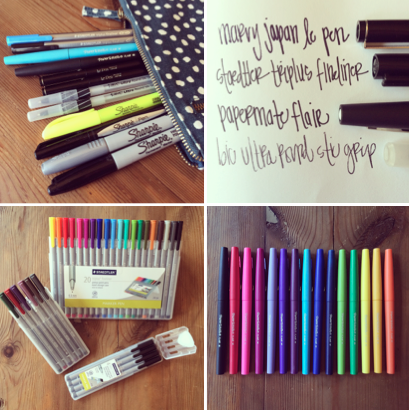 I usually have a black and silver Sharpie, Sharpie pen and a Sharpie highlighter - the basics. In the past few years, I've tried several different planners: the May Designs Months + Weeks planner, the Emily Ley Simplified Planner and the Lilly Pulitzer planner. There are things I like and dislike about each one. May Books are great if you want something you can easily toss in your purse, and the Simplified Planner is great if you want a lot of room per day. But I keep coming back to Lilly Pulitzer! It comes in four sizes, and there are always a bunch of patterns available. This year, I have the Large Jellies Be Jammin'. All Lilly 2014-2015 agendas are sold out, but they'll introduce the 2015-2016 agendas soon! It's a 17-month planner (August 2015 to December 2015) and includes a spread for each month, two pages for each week, Lilly-themed stickers, spiral binding, a front pocket and an elastic closure band. 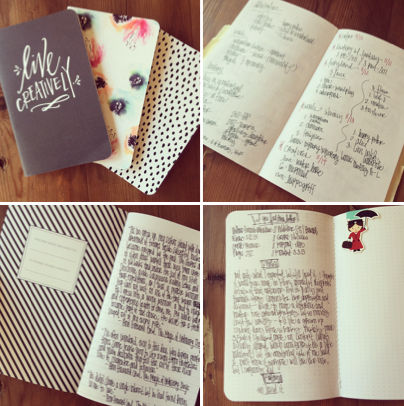 I use the planner solely for blogging, so I just keep it at home. While I sometimes use a digital calendar, I can't get away from a paper one. I'm too attached to it! As you can see in the one photo, I use washi tape to help me keep track of what I have for review and what I've pre-ordered. And yes, I color code my calendar. Ha! 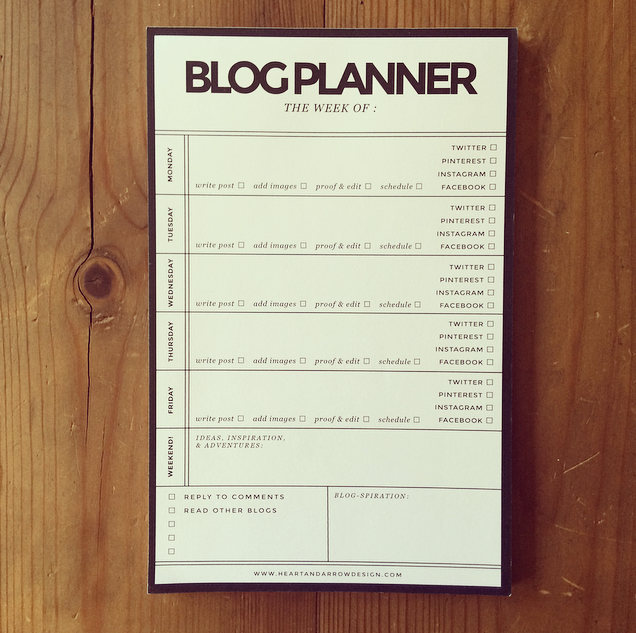 I recently bought this blog planner notepad from Heart & Arrow Design. I've only been using it for two weeks or so, but I like it so far! There's space to write what you want to post Monday to Friday, a social media checklist (Twitter, Pinterest, Instagram and Facebook) and a post progress checklist (write post, add images, proof & edit, and schedule). There's space for ideas and inspiration, as well as any to dos (reply to comments, read other blogs, etc.). I just tear off a sheet, stick it in my Foxy Dori, and then I have it whenever I need it! 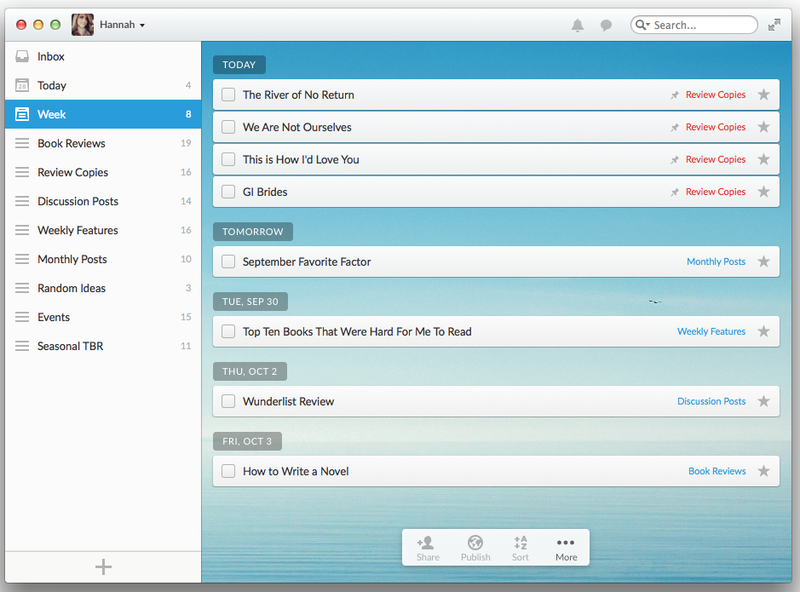 I've already written a whole post about how I'm obsessed with Wunderlist, and that's all still true. 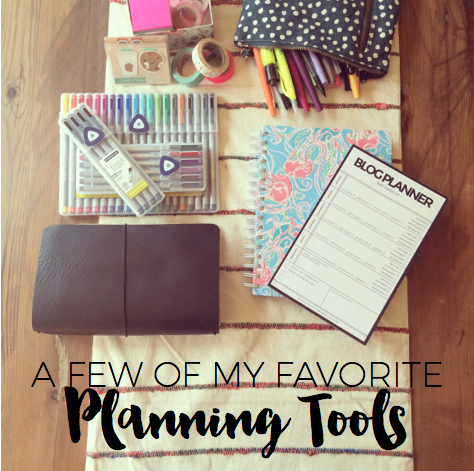 I'll always been a pen and paper kind of girl, but this is my favorite digital planning tool. I won't talk about all the ways I use it since I've already shared that on the blog, but I can't resist any opportunity to mention it. Seriously, download it! Do you prefer paper or digital planning? Have any questions about traveler's notebooks? You always find the CUTEST things! I loved seeing all the different things you use to stay organized. I'm a huge fan of the Lilly Pulitizer planners too! I got my first one last year and I can't imagine ever switching. I need to get some of that Scotch washi tape...it's so pretty! Ugh, this post was amazing, thank you for sharing everything. I ordered my own foxy dori this morning. This looks like a really great solution for what I've been trying to do with my journals/planners. I've been through so many, last year I had a hobonichi techo and this year I've been doing this weirdo combo of Passion Planner + Bullet Journal in an xl moleskine cahier. But the midori seems like such a better option. I'm so excited. I'm left-handed too, and I really like the Pilot Juice pens (.38). It looks like you prefer more of the brush style pens, but if you're in the market for good gel pens too, I like those a lot, and no left-handed smearing. Also taking notes of all of those pens because I have an addiction to pens. I can't even think about using a notebook that isn't a moleskine, but I'm open to trying new pens! 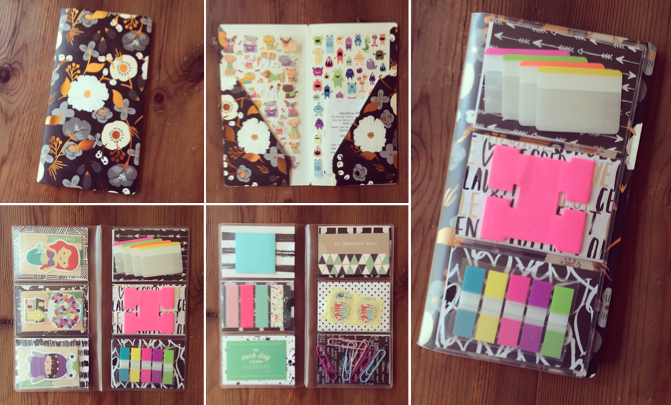 Thanks for sharing this organizational goodness, H! I have an MTN and totally love it! I decided after years of journaling and always having to find a new journal to buy and get used to, that an MTN would be worth the investment for me. Journaling has been an amazing habit that I've kept consistently for years now. I'm trying to think how I would use a passport size MTN, but I just can't justify that one. Ah well. Great explanation, I'm new to the 'Midori phenomenon' but you explained it so well now I understand things a lot better. your organisation tips are great to and you colour and style in your foxydori is cute! Thank you for this. You did a great job explaining the foxy dori and how you use the inserts. I'm inspired and I can't wait to get started! This was so insightful! I learned a lot more about Traveler's Notebooks, thanks. ^^ I'm still new to the planner world and I've been trying to see what type of planner would be best for me.